What is digital game addiction? A number of approaches, theories, and entire discourse communities have arisen in the past century to understand this thing called “addiction” (West, 2001; Bailey, 2005). According to West (2001), beginning with a behavioral psychology perspective, addiction “typically involves initial exposure to a stimulus followed by behaviors seeking to repeat the experience. After a number of repetitions of the behaviour-stimulus sequence, the addiction becomes established.” (p. 3). All the approaches, theories and discourses have attempted to explain this process of addiction. What leads to the initial exposure? What about the stimulus or the engaging with it leads to a desire to repeatedly seek it out? How does this repetition become so ingrained that it is hard, if not physically impossible, to stop using it? Medical, psychological, sociological, anthropological, economical, theological — all have weighed in on what causes this repeating behavior that is seen as ultimately deleterious to the person, even to the point of being perverse and sociopathic. Addiction is seen by all as a loss of control, only the reason for this being lack of control changes depending upon one’s metatheoretical viewpoint. However, while many have used qualitative, phenomenological methods, such as in-depth interviewing, to understand the perspective and experiences of the addict, there has been no systematic attempt to theorize addiction from an interpretive or constructivist viewpoint (Davies, 1998; Hirschman, 1992; Larkin & Griffiths, 2002). That is, a common approach has been an a priori application of some theory developed from someone looking at the addict and not a grounded theorizing approach of looking at addiction as an addict. This same status of inquiry and knowledge applies to media addictions, and specifically to interactive media such as the internet or digital games. Media addiction has been defined as feelings of being compelled “to consume media despite potentially negative consequences that make continued use rational or out of control, even in [the consumer’s] own eyes.” (LaRose, Lin & Eastin, 2003, p. 226). 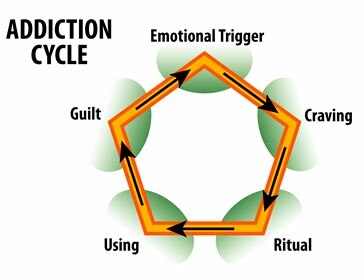 Again we see the conceptualization of the addict as being out of control and on a negative path leading to deleterious consequences they may or may not be aware of. Some have even attempted to classify this addiction using similar categorical (i.e. psychological and physiological) benchmarks that the DSM-IV uses for substance abuse (Charlton & Danforth, 2007). Researchers have labeled media addiction a result of physiological arousal dependency (McIlwraith, Jacobvitz, Kubey & Alexander, 1991; Finn, 1992), self-control or self-regulation deficiency (Finn, 1992; LaRose et al, 2003), and problems deriving from social learning theory (LaRose et al, 2003; Wan & Chiou, 2006; Wood & Griffiths, 2007). As with other types of addiction, there remains no real accounting for how the addict sees his or her repeated use of the media. The purpose of this study was a foray into the interpretations of self-confessed video and computer game addicts. Research to understand this particular addiction from the addict’s vantage has been done; however, there has not been a significant amount of qualitative assessments concerning video and computer game addiction. How did they see their addictions as affecting them? What did they see as being the process or processes that lead to their addiction? While a variety of theories concerning the development of addiction are considered in this paper, these theories were not used to guide the interpretation of the interviews that were collected. Instead, grounded theorizing was used to interrogate these addicts’ recollections of their periods of addiction. Using this analytic approach, the interviews yielded information that could be used to adjust any lingering problems of theories of addiction. Blame the body. The first discourse of theories, both expert and layman, focuses on the biophysiological nature of humanity and is most used when, and indeed developed for, discussing the use and abuse of chemical substances, ranging from alcohol to crystal meth. That is, addictions involving substances that a person has to ingest, inhale or inject in order to become addicted to it. Typically these substances do not include “food addictions” as no scientific proof has shown that food can provoke anything more than just a craving or a short-term inability to stop eating, such as the inability to eat small amounts of sugary or salty goods in one sitting. This discourse stems largely from the medical, psychological, and psychiatric fields where addiction is sometimes labeled a “disease” that can be “cured” either with drugs or psychotherapy (West, 2001; DiFranza & Wellman, 2007). Oftentimes the patient or “victim” is not to blame because the chemical dependency of the drug is just too strong as it literally rewires the neurological pathways of the brain (Finn, 1992). But as with any disease, the person needs a medical expert’s help in order to overcome the dependency. It is possible that the theories involved in this discourse could apply to digital game addiction. It may be that playing a certain video or computer game repeatedly is in some way connected to the pleasure centers of the brain, such that achieving some goal in the game may release endorphins or other pleasure-related neurotransmitters. This in turn could then resemble the same type of chemical dependency seen in substance abuse cases. However, no such study has yet to be conducted as we are only now beginning to understand the baseline reactions of the brain to game playing. Blame the soul. The second discourse of theories was perhaps the first evoked as it precedes science but not religion. In this discourse is found strong language of blaming the addicted person as having some level of moral deficiency. Addicts are seen as morally corrupt, lacking in some fundamental human decency, such as lack of willpower or moral fiber, and are thus responsible for their own downfall (Finn, 1992). The problem with this argument is its duplicitous nature; a person speaking from and for this discourse rarely comes out and directly attacks the addict for this failing, instead saying there is a “dynamic inconsistency” related to a “weakness of the will” and that people know they should make the “right” choice, they just do not for some reason (Skog, 2003). Also, there is no real way to scientifically verify this lacking except as operationalized as a lack of self-control, which has been subsumed by the third main discourse. While the argument for moral deficiency is not common in the realm of science, it is unfortunately still common in public discussions and representations. The representation of drunks and drug addicts may have moved from moral deficiency to more complex arguments involving physiological and sociocognitive factors, and even sexual addicts are seeing this move, but media addicts have not seen the same. The representations of “couch potatoes” for television addicts and “shut-ins” for internet or digital game addicts still remains prevalent in the media and thus public discourse. While work is being done to build in the same complex understanding as is given other types of addiction, this work is still a long way from becoming ingrained in the public mind. Blame the mind. The third discourse surrounding research and discussion on addiction can be seen as the scientific approach for what leads to addiction. Whereas the biophysiological discourse offers insight into what causes a continuance of abuse, the sociocognitive discourse offers insight into what causes the initial use and then repetition that leads to abuse. Unlike the moral deficiency discourse, theories from the sociocognitive are highly involved in the scientific process of study; indeed, as mentioned above, many scientists have attempted to measure the conceits of moral deficiency by conceptualizing lack of willpower as lack of control. Concern over the notion of self-control is fundamental in how this discourse approaches their understanding of addicts. 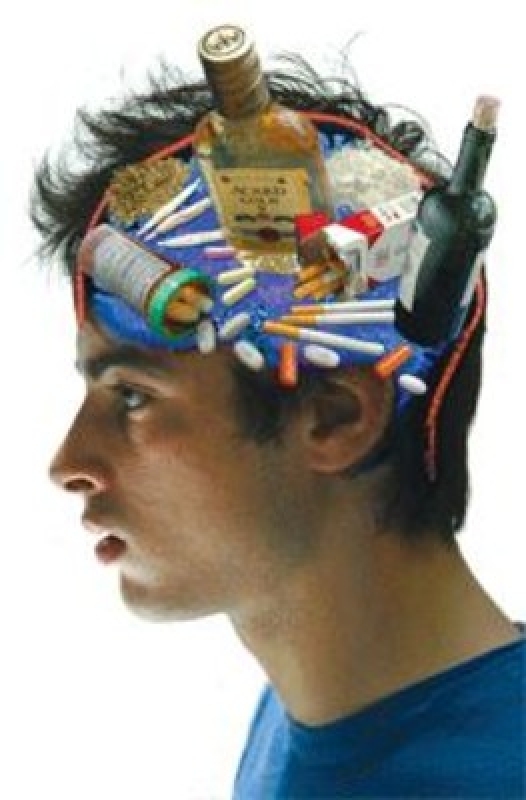 The argument is that addicts have problems with self-control and self-regulation in that they cannot control their own thoughts, feelings and actions. Additionally, the theories believe the addict’s ability to monitor and judge any reactions to their continual use of the substance have become impaired (LaRose et al, 2003). Unlike moral deficiencists, and similar to biophysiolocialists, sociocognitivists say this lack of control is not the fault of the person but is due to a variety of biopsychosocial factors (Finn, 1992). They then combine the language of both prior discourses by calling addiction a “disease of the will” (Davies, 1998), implying again the need for a medical cure. One reason proffered for why addicts cannot stop this behavior is that they have learned improper coping strategies. In this view, the interpretations of the addict to some stress is at fault, because that person has learned to handle stressful situations by using only their addictive object as a way of compensating for some problem (Finn, 1992; Sinha, 2001; Grusser, Morsen, Wolfling & Flor, 2007). Now, the self-regulation theories are closely linked to the rational, cognitive theories of people like Becker and Bandura (Becker & Murphy, 1988; LaRose et al, 2003). These theories postulate that people will engage with the substance in order to gain some perceived benefit, and that the continual reception of the benefit and its utility in helping the addict will result in the substance being continually used whenever it is seen as needed. That is, the addict comes to learn that the substance can do good things for him or her, it is comparatively easy and costless to get these good things, and the addict will continue to seek these good things even if these good things turn out to be very bad for him or her. However, while such theories are heavily weighted on the addict’s interpretations, the factors that influence this interpretation must also be accounted for (Tomer, 2001). Because this discourse focuses primarily on the addict’s interpretations and those factors that sway these interpretations, researchers on media addictions have also largely used this approach. The study of gained gratifications, where the reception of positive outcomes from playing can fuel repeated returnings, is the subject matter for the uses and gratifications branch of media studies. The uses and gratifications paradigm says people will choose to use some aspect of the media in order to gratify some need they have. Such choice is largely seen as being rationally, built upon the expectations the person has for the media to be able to satisfy the need that drives the use. If this use becomes “out of control”, then this use is termed abuse and addiction. Using this approach, media addiction has been studied in television use (McIlwraith, et al, 1991; Finn, 1992), but the rise of interactive technologies with the internet and digital games have spurred far more addiction research (LaRose et al, 2003). In particular to digital games, research beginning with gambling studies have investigated the reasons or “needs” for playing, from escape to mood modification (Wood & Griffiths, 2007). Over the past decade then, such research has taken either a social learning or uses and gratifications approach. While the sociocognitive discourse has been the most applied to digital game addiction, there do remain failings with this approach. The issue of lack of control is problematic because games can provide for a sense of control; indeed, uses and gratifications research has shown that to be one of the reasons people say they like to play these games (Reinhard & Dervin, 2007). How can we say a person is addicted to a digital game if they have a lack of control over their behavior when playing a game requires a high degree of control on the part of the player? Also, social and rational learning theories do not explain why outcomes are perceived as positive. The exact mechanisms are unclear as to why an outcome of playing a game would be considered a positive one by the player. Various addiction researchers have called for the need to understand how the person interprets the situation in which addiction occurs in order to understand what addiction is and how best to handle it (West, 2001; Larkin & Griffiths, 2002). This study was conducted as a way to begin to answer these questions. How do digital game addicts perceive their periods of addiction? What do they see as leading to this addiction and propagating it? How do the issues of control and gratifications appear from their vantage? How did they see what was happening in this situation as being connected to their experiences with the media. These ten questions were elicited for the overall situation in a Level 1 phase. Then, as a follow-up to probe deeper, the same ten questions were asked again for each of the answers given in Level 1, in what is known as Level 2. For analysis purposes, codes were developed based on specific blocks, here known as the question/answer combination, regardless of the level it occurred on. The data corpus collected contained 15 such interviews from 14 women; that is, one woman provided two situations of digital game playing addiction. For analysis purposes, only five of these interviews, from five different women, will be discussed in this paper. However, the main codes were originally developed across all fifteen interviews, and the goal of future work will be to apply systematically to the remaining interviews the analysis reported here. Also for analysis purposes, all identifying information was removed from the interviews. For purposes of reporting, these five women will be referred to as Cathy, Flora, Isiko, Nancy and Paula. All five women were students of a college course on interviewing and completed these self-interviews as part of their coursework. All were of European descent except for Isiko, who was of Asian descent. None were married, their ages ranged from 21 to 23 years, and three had already received their bachelor’s degree. These five women were chosen for the more detailed analysis for the simple reason that they had the highest frequency of the codes found during the initial grounded categorization. In this sense, their selection here represents the purest example of what will be discussed; using their interviews as exemplars allowed for a “cleaner” explanation of the patterns found, but the pattern should be tested on further interviews to assess the viability and reliability of what was found. Coding procedure. Codes were developed using the most recent version of N*Vivo in a grounded theorizing procedure, which also allowed for frequency counting and determining the extent to which the codes overlapped. According to Glaser and Strauss (1967), grounded theorizing should involve a series of reiterative categorizings, whereby the coder attempts to place different units of analysis (ex. phrases, sentences, themes, etc) into mutually exclusive categories (Clarke, 2003). This process is finalized once the coder has reached a point of saturation, where no new categories need to be created to accommodate the patterns discovered in the text. For coding purposes, the unit of analysis consisted of an interview block, defined as the answer to a specific question in the structured interview. The initial round occurred during the first read through of the interviews; at that time, no strict categories were determined, only patterns were highlighted. A second pass through the data yielded more tentative codes across all fifteen interviews. The third pass finalized these tentative categories by focusing on the five women discussed here. The results are two categories of codes, totaling nine codes in all: Flows of Power; and, Perceptions of Playings. 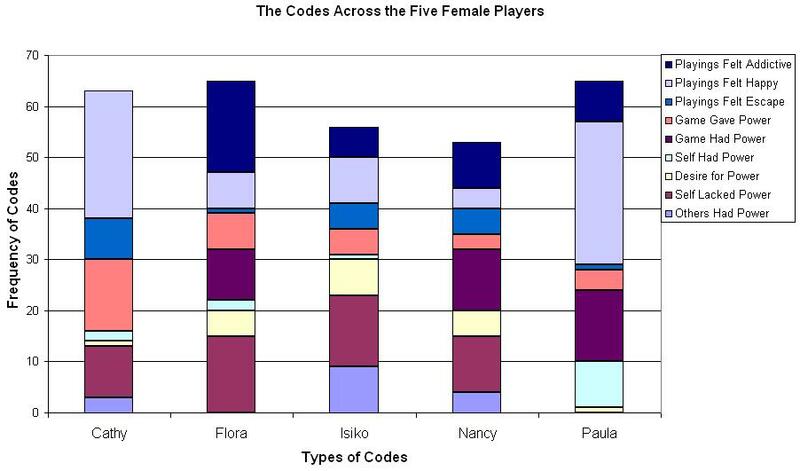 Figure 1 (above) represents how frequently these nine codes appeared across the five women’s situations and will be discussed in more detail after the codes are described. Flows of Power. This category of codes refers to interpretations of the women as to who was in control of any aspect of the situation at any time. As these situations were not one specific point in time and space, but were instead a string of moments, the six codes reported here represent different locations of power that could have been seen by the women at different times. Hence across the span of one interview, power could have been seen in a variety of locations, alone or simultaneously with another, and is hence described here as being a flow of power. The first flow of power coded, Self Lacked Power, was counted whenever a woman mentioned feeling helpless, hopeless, and/or not having control or power over what was happening. I lacked power because I was afraid to be myself and afraid to talk to people because I did not know if I would be expected. (Cathy, Super Mario Cart). I just wanted to know why I couldn’t control my life. Or why I was so scared to control my life completely? (Isiko, Dance Dance Revolution). The second power flow, Others Had Power, was counted when a woman was looking around and seeing other people or aspects of the situation as having more control in that situation than she did — including her own emotional state. Moody people have no control of themselves. That was always my issues, I let my emotions overtake me sometimes and go overboard. (Isiko, Dance Dance Revolution). I felt powerless because I knew I was not allowed to change rooms by the rules of the sorority. (Nancy, Snood). The third flow of power, Game Had Power, was counted whenever a woman indicated seeing the game has having gained control over her engagement with it. This is a specific subset of Others Had Power, where the focus was on the game. I thought I had power over the game but it had power over me. (Flora, Snood). We had completely handed over all our power to the game. (Paula, Super Mario Brothers). The fourth power flow, Desire For Power, was counted whenever a woman indicated some desire to have control, either in that situation or in general. I felt as though [if] I had enough self-control that I would not let Snood interfere with my schooling. (Flora, Snood). If I kept this up, I will never get to where I want to be in life. I need to get a sense of control soon. I need to get a sense of control before I graduate college. (Isiko, Dance Dance Revolution). The fifth power flow, Self Had Power, was counted whenever a woman discussed having received power or feelings of powerfulness in the situation — unless those feelings were achieved as a result of playing their game. I began making friends, having more in common with them because we all enjoyed Mario Cart, and this made me feel like I was becoming more powerful in the social aspect of middle school. (Cathy, Super Mario Cart). I guess we had the power because when we decided on what game we wanted to play we planned on playing for just a little while. (Paula, Super Mario Brothers). The final power flow, Game Gave Power, was counted whenever a woman discussed feeling powerful due to their engagement with the game. This code represented a specific subset of the Self Had Power category. This game made me feel powerful. When I played the game, I was always a winner, I was always the best and it made me feel good. I didn’t have a care in the world. (Cathy, Super Mario Cart). Our friendship felt very powerful because we had worked at something together and had done so well. (Paula, Super Mario Brothers). As seen in Figure 1, these six codes can be found to varying degrees across the five women’s interviews. All five women mentioned seeing power at some point as being in Game Gave Power or Desire for Power. Of the remaining four Flows of Power, four women indicated seeing Self Had Power while only three said they saw Game Had Power, Self Lacked Power, and Others Had Power. Perceptions of Playings. This category of codes focused on women discussing their reactions to their game playings. Three specific types of perceptions of the playings were discussed. As with Flows of Power, these codes could have occurred at the same time, but each represents a specific type of reaction to the game playing. The first code, Playings Felt Addictive, was counted whenever a woman said she felt addicted to or consumed by playing the game. I felt as though I was consumed through the game and nothing else seemed to matter at the time. (Flora, Snood). The media had connected us but had also made us not sleep or eat for days because we had become so addicted. (Paula, Super Mario Brothers). The second code, Playings Felt Escape, was counted whenever a woman said she felt that playing the game brought a sense of escaping something in the real world, from an actual situation to a feeling. It gave me a chance to escape my everyday troubles and feel good. (Cathy, Super Mario Cart). Sometimes I do avoid my problems and playing DDR suspended by problems for awhile. (Isiko, Dance Dance Revolution). The third code, Playings Felt Happy, was counted whenever a woman said she felt good, happy or excited because of playing the game. But the longer I play DDR, the less angry I get and the happier I become. (Isiko, Dance Dance Revolution). My sense of self was high because I was enjoying myself when playing this game (Flora, Snood). As seen in Figure 1, these three codes were present to varying amounts across the five women’s interviews. Only Playings Felt Addictive was not found for all women. In terms of amount, Playings Felt Happy was the most frequently found code. This is true when even compared to the Flows of Power codes. Looking at all nine codes, overall no woman had less than 50 codes for their interview. Overlapping Flows of Power. The codes for Flows of Power would found in numerous types and amounts of coding blocks across the five women’s interviews. Most often there would be one code per block, which when seen in this way indicates the extent to which power would change location depending on the moment of the situation as being faced by the woman. But what was even more telling of how these Flows of Power operate was when the codes were found to co-exist within the same coding block. Others Had Power and Self Lacked Power was understandably the most overlapped of all the Flows of Power. Quite often if a woman said she felt that she did not have control over herself, she was also describing seeing the power as being in the hands of someone or something else. I feel that I am too shy to fit in and that the “popular” kids will not like me as much. I feel that power relies on the older kids, with more friends. I do not have any friends in this new town and I feel that I lack power since I am alone. (Cathy, Super Mario Cart). I don’t think I knew/know myself anymore. I’m like a puppet and I do whatever is expected of me. I feel foolish. Don’t ask me why, or to explain more, I just feel this way. (Isiko, Dance Dance Revolution). Self Lacked Power was also naturally found to overlap with a Desire For Power. Women who said that they did not have power or control over their situation for some reason would also indicate a desire to have this control at some point. I felt powerless at the time but knew that I would have much more power after having lived through the situation. (Nancy, Snood). There were even instances when the woman did not directly indicate feeling they lacked power but did indicate seeing that Others Had Power and then also discussed their own Desire For Power. Having friends would have made me feel much better about myself. It would have made me feel more powerful. Adolescent girls have a lot of power when they are in [a] group and when there is an “outcast” among them, they make it much harder for that person to feel comfortable. (Cathy, Super Mario Cart). At other times women discussed how seeing that the Game Had Power was related to their own Desire For Power. I would have felt like I had more power instead of the game. (Nancy, Snood). Also, seeing that the Game Had Power was found to overlap with women saying they did not have this control, that Self Lacked Power. I lost my power in the game. (Flora, Snood). While on the flipside, other women would describe how playing the game made them feel powerful, as seen by the overlap of the Self Had Power and Game Gave Power codes. This overlapping of different Flow of Power codes in the same coding block is indicative of the extent to which the women saw power as shifting throughout their situation of being addicted. At times it would be external to them, pressing upon them, and they would have a desire to gain it. At other times something external presented it to them or they were able to assert their own power. Navigating these flows of power, whether consciously or unconsciously (but able to be recalled nonetheless), seemed to be a key characteristic in understanding how they saw and handled the situation. Overlapping Perceptions of Playings. As with the Flows of Powers, the codes for Perceptions of Playings quite often occurred alone in coding blocks. What was interesting was the extent to which they occurred simultaneously in blocks; and most interesting of all was that for these five women, there was no overlapping found for Playings Felt Happy and Playings Felt Addictive. These two perceptions appear to be diametrically opposed to each other, with Playings Felt Happy being a more positive perception and Playings Felt Addictive more negative. However, both of these perceptions did have overlaps with Playings Felt Escape, giving this perception the semblance of a fulcrum. A person could tip into either the positive or negative territory when talking about playing as being an escape. Examples of positive overlaps are between Playings Felt Happy and Playings Felt Escape. I enjoyed playing the game, it made my problems go away. (Cathy, Super Mario Cart). DDR is one of those games that kept me in shape, mentally distracted, and happy. (Isiko, Dance Dance Revolution). Examples of negative overlaps are between Playings Felt Addictive and Playings Felt Escape. This is why I was so addicted to DDR. It took me away from that world I was in of pleasing other people and me. (Isiko, Dance Dance Revolution). The media was my escape but it was becoming addicting. (Nancy, Snood). In comparison, there were more positive overlaps than negative ones; however, it cannot be said with certainty that the negative overlaps were indeed perceived as such when looking at the women’s words. It was by placing these sentences into the bigger picture provided by their entire interview that such an interpretation was more founded. Nancy was highly negative of her entire addiction situation, whereas Cathy was more upbeat about the role the game played in her life. Isiko was in the middle, sometimes extolling the virtues of the game and other times lamenting the oppressive situation she found herself in, in regards to her family, and how the game was an escape from dealing with such demands. Interconnecting Powers and Playings. Was this a quantitative study, where the results were the product of statistical methods, the most interesting topic for discussion would be how the Flows of Power predicted the Perceptions of Playings; that is, did certain flows better predict the positive or negative perceptions? Of course, such a study could also be just as interested in the reverse equation, in how well the perceptions predicted the powers. Being qualitative, this study was not concerned with causal directions but instead with understanding and describing the complex ways in which these codes were connected. Figure 2 (below) was generated, based on the overlapping described above, to pictorially represent this interconnectedness. The immediate impression generated by this image was that there appeared to be two clusters of codes, one that perhaps can be perceived as being positive while the other would be labeled as negative, and that these two clusters center around the code Playings Felt Addictive. To the right of this code are all the potentially negative Flows of Power codes — times when power was seen as not being under the control of the woman for some reason. 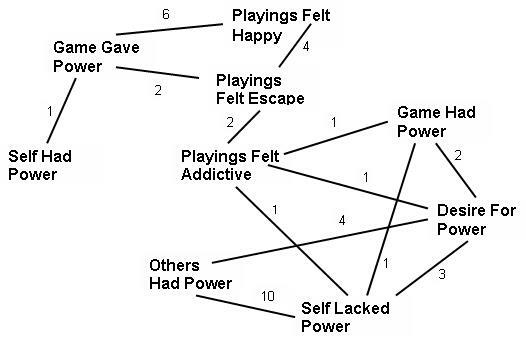 Thus, focusing on Flora and her discussing being addicted to the online game Snood, connections are shown between Playings Felt Addictive and Game Had Power (“I would never have lost myself in an e-game”), Desire For Power (“I wish I would have had more power not to begin playing and taking it too far with the amount of time I spent on it”), and Self Lacked Power (“I felt like I had no power over quitting the playing of Snood because I was addicted to it”). Across these connections, Flora seemingly discussed seeing her addiction as being related to a feeling of having lost control. However, Flora also reported feeling happy playing this game in relation to feeling powerful from playing it (“My sense of self was high when I was playing Snood because I felt enjoyment from the game and I felt success I as conquered each level”). This connection was found in the second cluster of codes. To the right of the addictive perception code were the potentially positive Flows of Power codes — where the woman felt empowered for some reason — as well as the more positive Perceptions of Playings codes. Interestingly, neither more positive power code was found to overlap with feelings of addiction discussions. Instead, Game Gave Power was found to overlap with Playings Felt Escape and Playings Felt Happy. This was especially true for Cathy. Discussing the role of Super Mario Cart in her life, she was the only one to make this link between feeling escape and being empowered. Video games make people get away from their real lives and have a false sense of superiority. It helps them to feel more important, especially when they are winning. She also mentioned the link with feeling happy and being empowered three times, more times than the other women. I felt powerful because I dominated the game. I never lost and it made me fool so good to feel like a winner. Cathy also never had overlaps that would lead to a more negative interpretation between feeling escape and feeling addicted. Unlike Flora, then, Cathy’s recollection of an addicted situation was not one dwelling on feeling a lack of power, but instead of how the game empowered her to deal with the situation. Isiko’s interconnections appeared more on par with Cathy’s, in that she was more likely to overlap Game Gave Power with Playings Felt Happy. Neither Nancy nor Paula saw overlaps between Powers and Playings. While any conclusions drawn from this small sample should be seen as tentative at best, the image provided in Figure 2 of these interconnections pointed to tantalizing interpretations worthy of further study. From Foucault do we get the idea of power being decentralized (Foucault, 1978); we cannot simply locate power in the hands of the authority or the populace at any one specific point and place in time. Instead, power is everywhere at every time, and who has it when and where becomes crystallized to us under certain conditions. For the five women in this study, when they described a situation in which they found themselves addicted to a digital game, be it computer or video, they did see power in the hands of a variety of entities at different points in their situations. At times the power was not in their hands — something about the situation was impinging upon them. Feeling lack of control in some way influenced game play, which can provide an alternative feeling of control. Such findings are in line with others who have viewed addiction as a coping mechanism (Clarke, Tse, Abbott, Townsend, Kingi & Manaia, 2006; Wan & Chiou, 2006). But because the player comes to feel dependent on playing to feel control, the game comes to control the player. Addiction steps in when the positive feeling of being in control while playing leads to the player repeatedly returning to the game, until the game is perceived as consuming and controlling them. They are compelled to continue playing the game. Also, it appears that navigating these flows of power are related to both the positive experiences of game playing and the more negative feelings of addiction. Sometimes the women did see themselves as lacking control over playing the game, but then they also saw this power being in other places as well during the time of their addiction. Perhaps the women were continually playing the game because it provided them the feeling of control that they lacked in the situation, but it was this need to navigate the flow of power swirling around them that partially compelled such activity. But then relying on this device for this need empowered the game to be seen as having control over them — they needed their “fix” and the game became their pusher. Feeling a lack of power may impel the start of playing. Receiving power during playing may produce a continual and repeated return to playing. Or receiving this power may lead to cessation, or cessation may be due to perceptions of power existing outside of one’s control. The curious finding came when comparing this navigating of flows with the perceptions of playing the game and the types of gratifications received from them. Some women, in describing their addiction, appeared more negative in their appraisal of the situation, while other women were more positive regarding the role of the game playing in the situation. This bifurcation was seen in the interconnectedness of these two categories of codes. Those women who were more positive had a cluster of codes indicating feeling happy and empowered from playing the game. Those women who were more negative had a cluster of codes indicating feeling disempowered and addicted. Accounting for this bifurcation at this time is by no means an attempt to make predictions as to how a person may feel about their game playing given how they navigate the power flows. Instead, the interconnectedness should serve as an example of the complexity that is to be expected given the nature of humanity. That for all the discourses developed and employed to describe, explain and predict addiction, one is never enough to accommodate the range of possibilities that is the nature of humanity. Some women may have been very down on themselves for their lack of control in the situation, while other women may have been quite pleased with the perceived gratifications of playing the game. And we cannot rule out the possibility of biophysiological factors playing their role for any of the women. Hopefully what this study shows, more than anything else, is that by understanding the interpretations of addicts we can approach an understanding for the complexity of addiction. The exact causation, process and outcome of the addiction may be difficult to pin down for any given individual. However, if we see it interpretively as the player does, then we can see that it is what the player sees as she navigates the flows of power that matters in understanding why addiction starts, continues, and, hopefully, stops. Bailey, L. (2005). Control and desire: the issue of identity in popular discourses of addiction. Addiction Research & Theory, 13(6), p. 535-543. Becker, G.S. & Murphy, K.M. (1988). A theory of rational addiction. Journal of Political Economy, 96(4), p. 675-700. Charlton, J.P. & Danforth, I.D.W. (2007). Distinguishing addiction and high engagement in the context of online game playing. Computers in Human Behavior, 23, p. 1531-1548. Clarke, A.E. (2003). Situational analyses: Grounded theory mapping after the postmodern turn. Symbolic Interaction, 26(4), p. 553-576. Clarke, D., Tse, S., Abbott, M., Townsend, S., Kingi, P., & Manaia, W. (2006). Religion, spirituality and associations with problem gambling. New Zealand Journal of Pyschology, 35(2), p. 77-83. Davies, J.B. (1998). Pharmacology versus social process: Competing or complementary views on the nature of addiction? Pharmacology & Therapeutics, 80(3), p. 265-275. Difranza, J.R. & Wellman, R.J. (2007). Sensitization to nicotine: How the animal literature might inform future human research. Nicotine & Tobacco Research, 9(1), p. 9-20. Finn, S. (1992). Television “addiction”? : An evaluation of four competing media-use models. Journalism Quarterly, 69(2), p. 422-435. Foucault, M. (1978). The History of Sexuality: An introduction (Vol. 1). New York, NY: Random House. Grusser, S.M., Morsen, C.P., Wolfling, K. & Flor, H. (2007). The relationship of stress, coping, effect expectancies and craving. European Addiction Research, 13(1), p. 31-38. Hirschman, E.C. (1992). The consciousness of addiction: Toward a general theory of compulsive consumption. The Journal of Consumer Research, 19(2), p. 155-179. Larkin, M. & Griffiths, M.D. (2002). Experiences of addiction and recovery: The case for subjective accounts. Addiction Research & Theory, 10(3), p. 281-311. LaRose, R., Lin, C.A., & Eastin, M.S. (2003). Unregulated internet usage: Addiction, habit, or deficient self-regulation? Media Psychology, 5, p. 225-253. McIlwraith, R., Jacobvitz, R.S., Kubey, R. & Alexander, A. (1991). Television addiction: Theories and data behind the ubiquitous metaphor. American Behavioral Scientist, 35(2), p. 104-121. Sinha, R. (2001). How does stress increase risk of drug abuse and relapse? Psychopharmacology, 158(4), p. 343-359. Skog, O.J. (2003). Drug dependence as motivational conflict. Tidsskrift For Samfunnsforskning, 44(1), p. 67-82. Tomer, J.F. (2001). Addictions are not rational: A socio-economic model of addictive behavior. Journal of Socio-Economics, 33, p. 243-261. Wan, C.S. & Chiou, W.B. (2006). Psychological motives and online games addiction: A test of how flow theory and humanistic needs theory for Taiwanese adolescents. Cyberpsychology & Behavior, 9(3), p. 317-324. West, R. (2001). Theories of addiction. Addiction, 96, p. 3-13. Wood, R.T.A. & Griffiths, M.D. (2007). A qualitative investigation of problem gambling as an escape-based coping strategy. Psychology and Psychotherapy: Theory, research and practice, 80. p. 107-125. Previous What Makes For a Good Online Community?